A Hartlepool grandad with terminal cancer has been left heartbroken after his beloved allotment was targeted by arsonists. Leslie Robinson, 57, from Waldon Street, was devastated to find that the allotment he had spent four years looking after had been completely destroyed overnight by arsonists. Leslie Robinson who has terminal cancer is devastated his allotment has been targeted by arsonists. 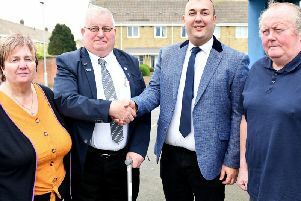 Mr Robinson, who is currently battling terminal lung cancer and chronic obstructive pulmonary disease (COPD), looks after the green space in Chester Road, Hartlepool, along with wife Sue Robinson, 52, and friend Dave McKay, 59. He used the allotment as a place to get away from it all throughout his illness, but has now been left with nothing following the callous attack. Mrs Robinson, who is a full-time carer for her husband, said targeting the allotment has taken away what is left of her husband’s life. The mum-of-six said: “We are devastated. “My husband has cancer and he always loved going to the allotment. “Whoever did this has taken my husband’s life away. Mr Robinson, a former Hartlepool bin man, was diagnosed with cancer last year and was given just three to five years to live. He is also battling a blood condition polycythemia and had used the allotment grow vegetables and flowers to put on his grandson’s grave. Mrs Robinson said they had also kept a caravan on site worth £800 which, like the rest of the allotment, was destroyed in the blaze. Luckily, their 100 racing pigeons managed to survive. She added: “I want justice for what they have done. It is heartless. “In the caravan we had photos of all of the grandchildren hanging on the walls, but they have been totally destroyed. “They have taken away my husband’s hobby, but we are not going to give in. A Cleveland Police spokeswoman said: “We received the report at around 9am on Wednesday, October 26. “The incident is being treated as suspected arson and enquiries are currently ongoing.